and I had a woman on etsy make it into a night light for me. Most days I think of a handful of things I want to talk about here. I sit outside for a few minutes most mornings while the dogs do their business and I drink some coffee. Then I sit outside and meditate in the am hours before bed. Then I'll usually catch a sunset. These are all fertile times for inspiration to flow into my head. Lately just watching the sun go down in and of itself inspires deep thought. For example, I might see the squirrels retiring for the night and think of the rhythms all (or most...I haven't researched this!) living things keep to the beat of the sun. Most are active during the day, but others like the neighborhood fox and crazy loud barred owls, prefer the night. But we all have our routine. You can learn a lot about life from just watching the sunrise and sunset. For probably two years I kept a journal of twice-weekly sunrises along the river and never made the same entry twice. Now it's the sunsets that are calling me. But it's not just the insights from nature that happen during these times outside. Many times it triggers insights from things in my present or past. In many ways, the two years of sunrises are what inspired the three years of tarot-inspired insights I has on this blog. And now we're moving back to nature...or rather back to whatever springs from me internally. Anyway, four paragraphs in and none of this is what I want to talk about today...haha. 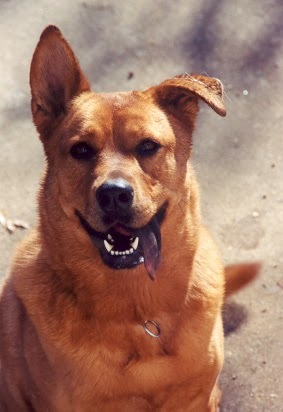 What has been on my mind a lot this weekend is my deceased dog, Passion. As a person who never wanted kids, but always wanted dogs, Passion was my pride and joy. She was big and beautiful. Because she was a redhead with a lot of chow chow in her, many called her Mufasa. I have never seen the The Lion King, so I took their word for it. I believe that all of us serve us an angel to others at one time or another. While we're always here to serve each other and the earth, I believe there are certain times when we are moved by an invisible hand to be just what another needs in a fleeting moment. Like the moment a woman whose name I can't even remember anymore once told me, "be sure you're running to something, rather than running away from something, Tierney." Those words were extremely important to me in that moment and completely changed my outlook on my career from that point forward. They were the words of an angel, delivered by a human. Now, I'm not someone who necessarily believes in angels. So when I'm saying that word, I'm not thinking of a being with wings. I'm thinking of the voice or message or gesture of god or spirit or grace coming moving through another to bring you divine guidance. These moments have happened with friends, with strangers and, for 10 years straight, in many ways, from my dog Passion. As my first dog that was all mine (we had dogs growing up), Passion was filled with firsts for me. One of the firsts was the first time anyone ever recommended I put a dog down. See, before she even turned one, Passion went lame and needed very expensive hip surgery. I was told that most people would put a puppy like that down...twice...by professionals. She was going to be a big dog (100 lbs)...the surgery may not last...she would have difficulty all her life...blah, blah, I don't even remember all the reasons they gave me. Growing up, our dogs were our dogs, but they weren't children, you know? So when all of this happened, I thought she was cute, I knew she was special, but was I prepared for a lifetime of challenges? My brother told me I shouldn't spend the money if I was going to resent it. This is a big thing, because it told me that if I decided in my head that I was going to do it, I should just do it and never think of it again. That helped me swallow that large bill. 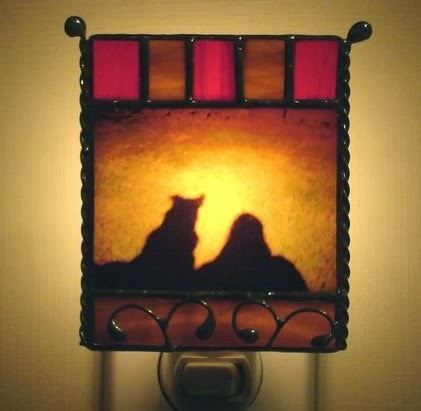 The night light made from the image above. But there was still a place in my heart that hadn't committed to Passion yet. She was still a puppy. Still making trouble here and there. If she had the surgery, it was going to mean a lot of patience on my part while she recovered. I was going to have to be very gentle with her. Up until that time we'd had some debate over who was going to be the alpha and I would roll her and get in her face and bark at her (this was something I'd read online, and it did work...she was VERY alpha). Was I up to this? I had to make a decision. I still remember the day when I looked her in the eye and decided to give her the surgery without resentment, love her even if she barfed and pooped on everything I owned, be more gentle with her, and hold her in my arms while she took her dying breath. There are a lot of differences between children and pets, but one of the most critical I think, is that every pet owner agrees on some level, going in, that they will ask someone to administer a lethal dose to their baby then hold their baby it as it dies. What I learned that day as I looked in Passion's eyes is perhaps the most valuable lesson I will ever learn—to love unconditionally. It was a decision I made and I never looked back. The reason I say Passion is an angel in fur is because, well, she was a unique girl. My boy Kizzie and my girl Magick (and possibly even my girl Mystic) are just dogs. They're dog souls in a dog body and enjoy the rhythms and depth (or lack thereof) of a dog's life. Passion was not that way. Passion was clearly a "human soul" who chose to come down here and serve time in the prison of a dog suit and dog brain to live an incredibly boring dog life with me....all to teach me about love and dignity and limitations of various kinds. Anyone with children knows what unconditional love is. It's different from the love parents receive in return, though that may be unconditional. It's different from what you feel for your spouse or any other person. It's a love that says "you can push all my buttons—neglect me, anger me, disappoint me—and I will be rendered incapable of offering you anything but my complete love." It's a thorough letting go of all present and future anger and resentment and judgment and yielding entirely to love. It is the highest form of love, imo. And for people who don't want children, our pets let us experience it. This post is already too long. So trust me when I say Passion was magnificent and human in so many ways. She thrived when given situations where critical and analytical thought were key. A dog's life was way too limiting for her. I know this sounds crazy, but about the age of 9 she started telling me she was ready to go...she'd had enough. Within a year she developed the disease that would make that possible. One day she was fine...just an aging girl. The next day I was told that she needed to be put down immediately. This time I followed their advice. I spent one last night with Passion. She was 10 years old. The professionals were wrong about her hip. It held out and never gave her trouble again. Had I listened to them, I never would have known her. I know it sounds crazy, but in so many ways she was my equal. In so many ways, she was my superior. She was stubborn and overbearing and she meted out her love completely conditionally...haha...but if I ever meet a human as incredibly amazing as her, I will be truly blessed. We sat up together all night and talked. A few of the neighbors came by to pay their last respects to her. She was sort of the grand dame dog in the neighborhood. Then we just laid on her beddie boo by the window holding hands and talking all night. When I would have to get up to go to the bathroom, she got scared...the only times I ever saw that big toughie scared in her life. She knew what was happening and needed me to be there for her. She was too weak to keep being strong. And the next morning I sang her song to her as she died in my arms. When I finally let go and placed her on the ground, I leaned over her and kissed her and one final puff came from inside her. In that moment she was gone. In the movie, Mufasa told Simba, "there's more to being a king than getting your way all the time." In many ways, that's the lesson Passion taught me. She taught me to open my heart enough to let someone else in...something no human relationship had ever taught me. And, of course, she taught me unconditional love. I would absolutely not be the person (or doggie mom) I am today without Passion reflecting my stubborn, impatient and overbearing ways back to me. A while after her death, I drew a tarot card asking for a message from her. It showed a mother bear in spirit looking over her three baby bears while they slept. Because I often called her Pashie Bear, there was simply not a better message I could have gotten. She watches over us. Passion gave up a human incarnation, imo, to be a dog with hip issues stuck in a non-challenging life...all to be my angel and saving grace. She loved me that much. Of course, it's not like she didn't learn any lessons from me. But outside of my parents, I don't know who would or could ever affect me as deeply. The lessons I learned from her were so huge they reshaped my life from that point forward. Does that soul exist for you? What lesson have you learned from them that you weren't able to learn from anyone else?